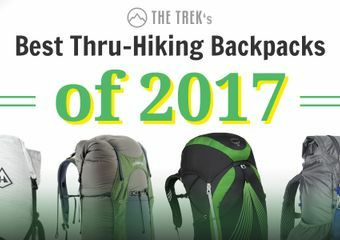 In this installment of The Trek’s 2017 Hiker Survey, we cover backpacks and shake downs. We asked hikers about the frame type, capacity, brand, and model of their backpacks. In the past, we’ve found that the load within that pack affects hikers’ perceptions of the backpack itself, so we’ve also looked into the weight hikers carry, the items they decided to “shake down,” and the items they decided to carry. For the charts and details, keep reading, or else skip to the TL;DR at the bottom. 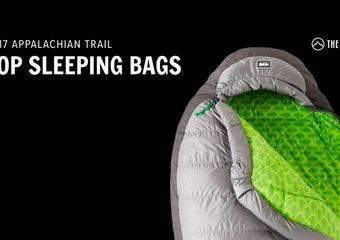 Also, check out our updated list of the best backpacks for long distance backpackers. 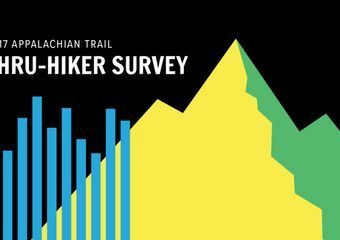 Two hundred and fifty three hikers participated in the survey, all of whom had walked a section or thru-hike of the AT in 2017. Three quarters (74.5%) were thru-hikers and the rest were section hikers. For more details on the hiker demographics, check out our post with general information from the survey. Most hikers had done backpacking trips just a few days long, prior to their thru-hikes. Extensive experience and utter lack of experience were both uncommon. Most hikers used internal frame packs. Frameless packs, which are typically used for ultralight backpacking, were also used by a substantial minority of hikers. One of these hikers noted that they removed the frame from a standard internal frame pack, and others may have done the same. The older external frame packs were used by a handful of hikers. 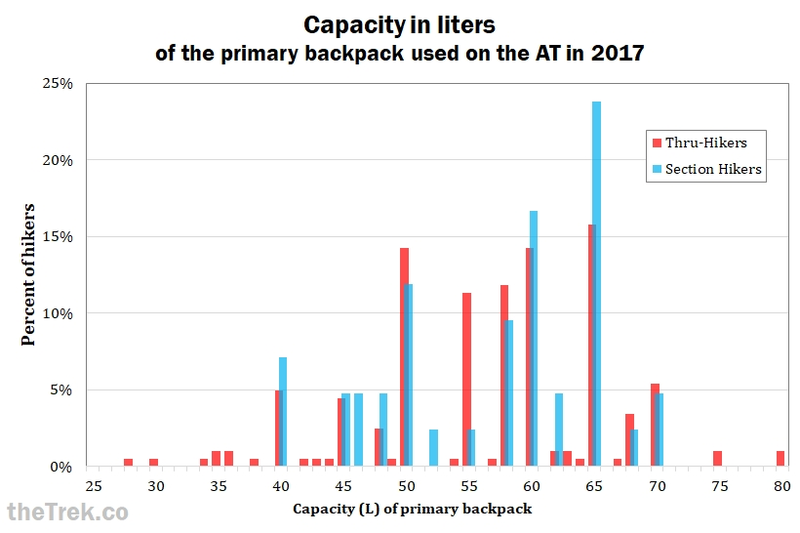 Thru-hikers packs had an average (mean) capacity of 52 liters, but anything between about 42 and 63 liters was common. Section hikers’ packs were slightly (but not significantly) larger, with an average capacity of 55 liters. 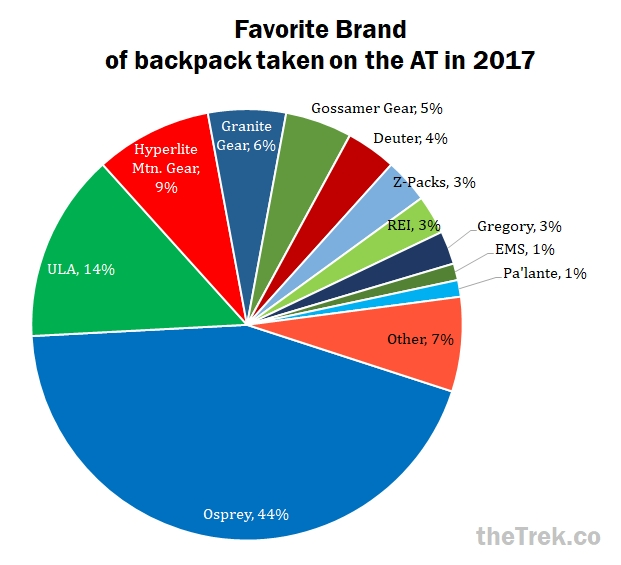 We asked hikers which brand and model of pack they used on the AT was their favorite. 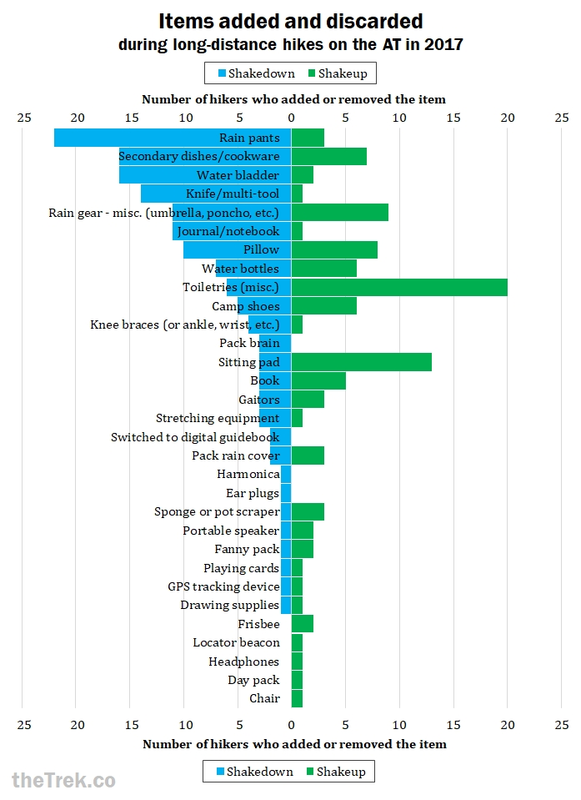 Only a handful of hikers disliked every pack they used, so these data were not included in the charts and lists below. The Osprey Exos was the most popular pack overall, used by 12 percent of hikers in the survey. The most popular women’s pack was the Osprey Aura, used by 8 percent of hikers. ULA’s Circuit was the most popular ultralight pack, also used by 8 percent of hikers. “Base weight” refers to how much a backpack weighs when it is filled with everything except food and water. This often fluctuates during a long-distance hike, but it is more stable than total pack weight with food and water. Hikers in our survey reported the typical base weight during their 2017 AT hike. Thru-hikers’ average base weight was 18 lbs. Base weights ranged from 5 lbs. to 35 lbs. The average base weight for section hikers was 22 lbs., with a range from 11 to 38 lbs. Furthermore, there was a small, but significant, relationship between distance hiked and base weight, meaning hikers with lower base weights were more likely to have walked further. 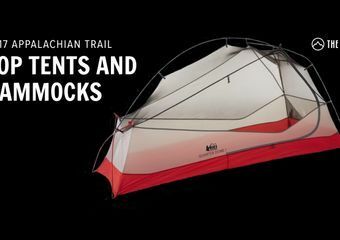 This could be because thru-hikers “shook down” their packs more, invested more money in lighter gear, or it could be that a lower base weight helped people stick with it. 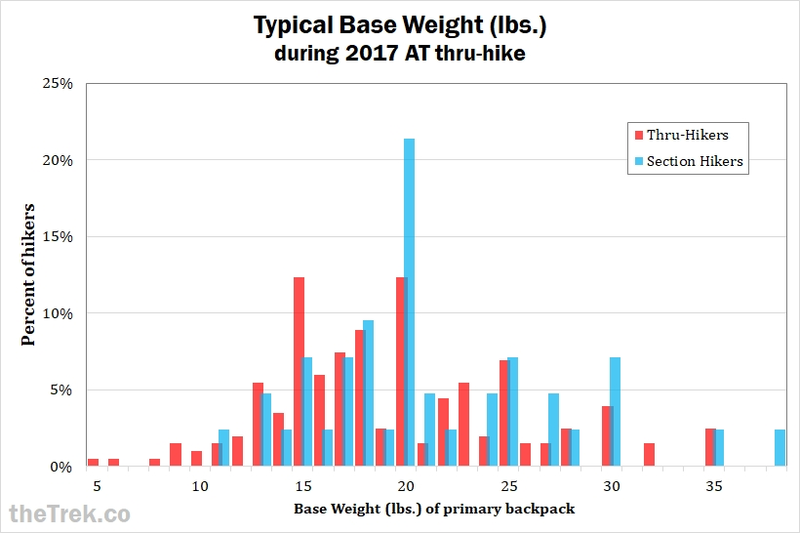 This is consistent with the pattern we observed in 2016, so I would even more strongly recommend that anyone planning to thru-hike should attempt to get their base weight as low as possible, but at least 20 lbs. or less. Our findings about weight and capacity were consistent with what we found last year: hikers with larger packs (higher capacity) tended to have great base weights, but hikers with frameless packs still carried base weights that were comparable to hikers with framed packs. Frameless packs are typically designed for ultralight hiking, but the people using these packs aren’t carrying less than anyone else. 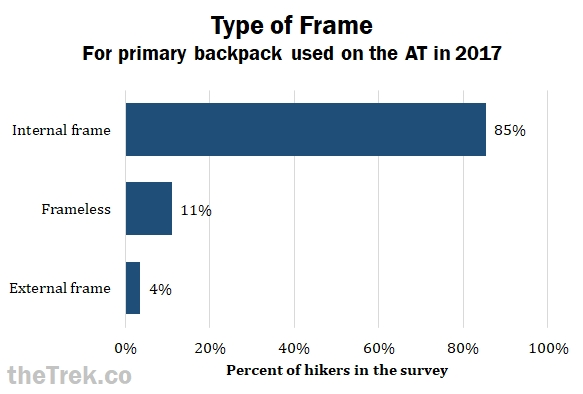 Just like last year, we found that hikers with heavier loads reported lower satisfaction with their backpacks, even when controlling for frame type and distance hiked. When accounting for a higher pack capacity, this predicted dissatisfaction even more than base weight did. This means that hikers find larger backpacks more uncomfortable, but also they are attributing pack discomfort to the backpacks when the heaviness of the appears to be the source of that discomfort. Furthermore, consistent with our 2016 data, hikers with more previous experience backpacking were more satisfied with their packs, even when controlling for base weight, capacity, and frame type. This suggests that the more practice hikes you take, the more comfortable your pack and load will feel. Considering we have seen this same pattern two years in a row, I have to emphasize that, if your pack is uncomfortable, try to reduce the weight of the contents inside before you try to change up your pack. Most likely, the backpack is not the problem. Furthermore, don’t carry an ultralight pack and then fill it up with a heavy load; this won’t help at all. In order to address this pack weight issue, we also asked hikers about their “shakedowns.” We didn’t get a comprehensive list of the items hikers brought the entire way, but we did see what items hikers discarded or eventually added to their packs. Most hikers didn’t add and remove these items, but it isn’t unusual for people to send these items home or pick them up along the way. Most of these items, such as bear canisters and bear spray, are commonly used (or required) in other regions of the U.S., but they are unnecessary on the Appalachian Trail. Bear spray is primarily designed for use with bear species like grizzlies, which we don’t have on the east coast. Before hiking the AT, you should educated yourself on behavior around black bears, and if you do that, you won’t need bear spray. As woman who was traveling alone, I did bring pepper spray on my 2014 thru-hike, but that was a precaution against creepy men, not wildlife. I never had to use it but I did feel safer hiking alone at night, and it hardly weighs anything. Some items are neither absurdly overkill nor absolutely necessary. Some things ended up on both the “shake down” and “shake up” lists. This graph shows how many people discarded these items (on the left) and how many added them (on the right). Water purification of some kind: if you don’t treat your water, you are more likely to get sick. End of story. Soap or hand sanitizer: you’re probably fine if you just bring one or the other, but you’re likely to get sick if you don’t bring either. Compass: If you don’t bring a compass, whistle, and light source, you are likely to get lost and/or injured. I was astonished that NINE hikers said they discarded their compasses, especially after the widely publicized death of Geraldine Largay. She did not have a compass and left her SPOT device in a hotel room, then died only two miles from the AT because she became lost and disoriented. Compasses are small and lightweight, so there’s no reason to discard them. Trowel: I did not bring a trowel on my AT thru-hike, but I’ve learned more about Leave-No-Trace practices since then, and become more concerned about the heavy traffic on the AT. Please consider bringing a trowel. Groundcloth: Groundcloths, trekking poles, and duct tape are staples that nearly all thru-hikers rely on, so bring these unless you have extensive experience and a specific reason not to. Battery pack: Nine hikers added a spare battery pack and no hikers shook this down, so it might be a good idea to bring one. Most long distance hikers use internal frame packs, but ultralight frameless packs are also popular. If you intend to thru-hike, aim for a base weight of 18 or even 20 lbs. or less. Hikers who used frameless packs still carried just as heavy of a load as those with standard internal frame packs. Use a framed pack if your base weight is 20 lbs. or more. There’s no need to splurge on ultralight gear if you aren’t actually hiking ultralight. For inexperienced backpackers, know that the more practice you can get, the more likely you won’t have problems with your pack. For practice hikes, make sure to fill it with the amount of weight you anticipate carrying. If your base weight is higher than 20 lbs. and your pack feels uncomfortable, keep in mind that the load, not the backpack itself, is most likely the problem. Try shaking down your pack rather than replacing it. If you’re unsure what to shake down, the items on the chart above might be a good place to start. In particular, extra sets of clothing or special clothes for sleeping in are probably redundant. Although some hikers in the survey discarded health and safety items like compasses, water treatment, and hand sanitizer, we caution you against this. These items are very lightweight and reducing the risk of illness or danger is worth the minor addition to your base weight. Support cottage industries and small businesses when you can! But if you don’t know where to start regarding a pack to buy, try one of the common brands/models shown above: the Osprey Exos for a standard pack, the Osprey Aura for a women’s pack, and the ULA Circuit for a lightweight pack. Many thanks to all the hikers who participated in the survey! Congratulations for walking so far! I am grateful to Maggie Slepian and Zach Davis for their input and for distributing the survey. Check out the overview post for this years’ survey, as well as the posts on sleeping bags and shelter systems. If you’d like to be updated on subsequent posts, subscribe to The Trek newsletter. Really nice analysis! Behavioral research (quantitative/surveys and qualitative/focus groups) is my professional jam and this offers solid insights for anyone gearing up. My own kit will change for this study. One thought: If the survey has been consistent from year to year (as it appears, minus the added questions, of course) you might consider rolling two or three years together to raise your sample size. Much of the specific gear used is conceptually the same (if not identical) from year to year so you probably have very conclusive, highly-reliable data here. Given your academic study, I’d also be very curious in your own psych analysis, along with a physiological analysts’ take on weight v. comfort v. success. I thought it was interesting that the recommendations on things to avoid included a number of things not on the shakedown/shakeup list (like a seperate baselayer for sleeping). I’d love to see more analysis on that. Hi, let me clarify. I broke the shakedown list into three sections: seasonal changes, things most people don’t need, and items that are a matter of personal preference. Base layers are under the common seasonal changes section. I recommended hikers bring them, but typically they aren’t needed for the whole hike. I tried to be as clear as possible but I really hope no prospective hikers get those sections of the post mixed up! We’d like to do that in the future. The software we used to collect analyze data has changed from year to year so this will take some extra time, by5 I plan to combine it when I get a chance. Disagree with a female urinary device as being unnecessary. IMHO so much easier than taking off your pack and going off trail to find privacy to drop your drawers! Most women I hiked around had one. These charts are brilliant. Instantly comprehensible, they present a wealth of useful information. My compliments to the chartist! That very talented chartist is also the very talented author of this post, Mariposa. Just thought I’d mention that I section hiked 873 miles of the AT in 2017 with a 7 lb base weight. (I’m getting back in shape from the heart surgery that blew up my thru hike in 2016). So I kind of had to go light. I never bought a single ultralight item just threw the bare bones in an old book bag and hit the trail. I haven’t finished so didn’t participate in the survey. Is pack base weight correlated at all with hiker weight? I would suspect that heavier people can tolerate a heavier pack, and their necessary gear may be marginally heavier–size XL weighs more than XS. I don’t understand why you recommend not taking a first aid kit. No matter how small, something is better than nothing, especially on a trail where hundreds of people wind up going home each year because of injuries. Most hikers only pared down their kits. They did not remove them entirely. nice write up! – question for the community though, i was under the impression that bear canisters were now required on several sections of the AT, most notably SMNP. Additionally, I was up in N GA last summer with the family doing a morning hike to Blood Mtn, from the day use area down the road from Mountain Crossings, and the ranger board stated that area also required bear canisters (specifically rigid canisters, bear sack not allowed). I think that a canister is required only if you camp overnight in certain sections (I can’t remember the exact start/end point). Most thru-hikers just choose not to overnight in that section. But just hiking through it doesn’t require a canister. Great analysis. I realize it is a project to pull all this together but I at the same time I wish you also showed results based on gender and age groups.